Pradeep has over 9 years of diversified experience in the IT industry that spans across multiple technologies. He is an accomplished database professional and speaker with the right blend of business and technology skills. 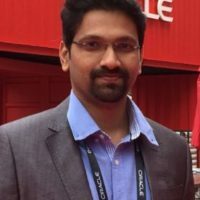 Mr. Pradeep has bootstrapped various Strategic Business Units in his career and is currently into Infrastructure Managed Services and an evangelist in Oracle Cloud. Pradeep is a regular speaker at Sangam, ODevCYatra (a yearly conference organized by AIOUG), and the regular monthly meetups across cities in India. Pradeep has Experienced in managing Oracle Applications from versions 11.5.10 through 12.2.x, OBIEE 10g/11g/12c, BI-Apps, Endeca and also in all Oracle RDBMS versions from 9i thru 12.1.0.2 with/out ASM along with High Availability Solutions like Golden Gate and Dataguard.